ROAD TOWN, Tortola, VI - Director of the Water and Sewage Department, Mrs. Perline Scatliffe-Leonard said she is anticipating that the building which houses her staff will be completed by the middle of the year, before the hurricane season begins. This is according to a press release from the Government Information Service which states that Mrs. Scatliffe-Leonard provided that information when she was updating Minister of Transportation Works and Utilities, Honourable Kye M. Rymer and his officials during their recent their visit to the offices of the Water and Sewage Department in Baughers Bay. The director said she is also looking forward to the completion of works so that her staff will be more comfortable while they perform their daily tasks. She thanked contributors to the project for their continued assistance including local concrete and water production companies, which she said enabled the department to replace the galvanized roof with a concrete roof. The director said that the visit of Honorable Rymer and the ministry’s officials was well received, and that she was pleased that the staff was able to share their concerns with the officials. 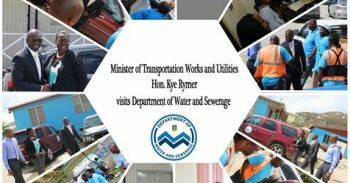 Honourable Rymer will continue his familiarisation tours to the departments under his ministry. So far he has visited the Facilities Management Unit and the Virgin Islands Fire and Rescue Service.